I've always loved flowers and in the 1980's and early 1990's I did several paintings of a single flower and groups of single flowers like roses and irises on a flat colored background. It's something I learned from Vincent van Gogh when he said to learn to paint Roses by painting a single Rose. I did a lot of those, and groups like this. 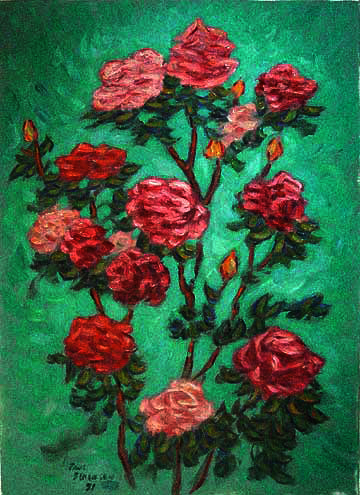 This one of red and pink roses on A Green Background has always been one of my favorites.